Tourist hot spot I suspect. Nothing unpleasant about it. Very busy but service was prompt. Nice sheps pub,excellent Whitstable bay beer! Saturday afternoon, seemed tourist and eating oriented. However, Bishop's Finger in very good condition and reasonable prices for the area. 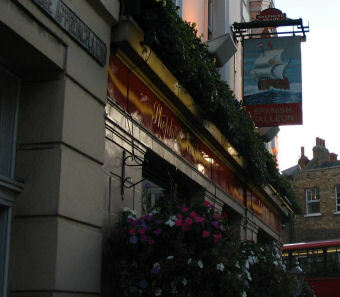 We called in here on Thursday afternoon on our way from the DLR station to visit the Cutty Sark. Yes, I guess that it was populated by more tourists than by locals, but it was comfortably busy and certainly does not rip off its customers, like many pubs in some other popular tourist areas. 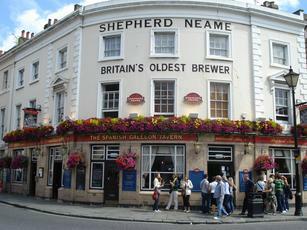 Three Shepherd Neame brews on the handpumps – Spitfire, Whitstable Bay Pale and Spooks Ale. The Whitstable Bay, whilst not perfect was very quaffable, and the food – mainly from the on-site fish and chip shop looked good and was reasonably priced. No problems with the service either. Overall it rates a good 7 from me.